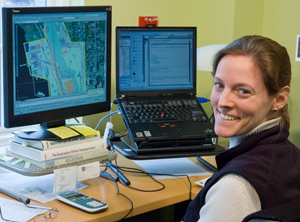 Nearly 25 years ago, three Dartmouth College professors created a new company to provide consulting services for the planning, analysis and management of transportation, natural resources, technology and business. Today Resource Systems Group (RSG) is 100% employee-owned and has repeatedly been recognized as one of the best companies to work for in Vermont. RSG’s road to employee ownership began in 1994. At the time, the founders needed to establish a long-term mechanism for ownership transfer, but they also wanted to share equity with the employees who had helped make the company successful. Their primary goal was to assure business continuity and job security. They could have sold to outside interests, but they weren’t ready to exit the business, and they were concerned that an outsider might move the company out of state. An Employee Stock Ownership Plan (ESOP) was the perfect solution. Another common occurrence in consulting firms is that worries about a possible sale of the company can lead people to leave. “The ESOP removes a lot of the angst about the transfer of ownership,” says High. It also creates a mechanism for an orderly and ongoing transfer of ownership as employees come and go. The company’s ESOP has been a great success, in High’s eyes. In 2004, the percentage of the company owned by the ESOP increased to 71 percent. Then, in 2009, the remaining shares were sold to the ESOP, making the company 100 percent employee-owned. The ESOP has had a positive impact on the company’s working environment. “Employee ownership colors the whole culture,” says Erica Wygonik, former senior associate at RSG. “New hires “are assumed to be smart and competent and are given the resources and flexibility they need to do the job.” Colleagues are constantly learning from each other, and information is shared freely throughout the organization. “Every month, we hear about the company’s performance and review current projects,” says Wygonik. The company has received many awards, including the Deane C. Davis Outstanding Vermont Business Award in 2007. It has also been named one of the Best Places to Work in Vermont four years in a row due to the company’s excellent compensation and benefits packages as well as its ownership culture. The company distributes as much profit at year's end as possible in the form of bonuses, while retaining enough earnings to have a ten to 20 percent appreciation in the firm's overall ESOP valuation. Employees receive an additional three percent of total compensation in the form of ESOP shares, which have appreciated an average of 16.5 percent the past six years. Each employee also receives another four percent match in his or her 401(k). RSG allows its employees to telecommute on a case by case basis. And compressed work weeks allow full-time employees to work longer days for part of the week or pay period, in exchange for shorter days or a day off each week or pay period. All employees are eligible for an annual training and professional development benefit after six months of employment. The company donates five to 10 percent of net profits to charity each year and provides employees with flexibility to participate in activities during the business day. Employees get one day of paid time off each year to get involved in community service. All of this has helped create a great sense of camaraderie at RSG. Because of the ESOP, employees know that the company’s culture is more likely to last – and that all employees will benefit from their shared success.